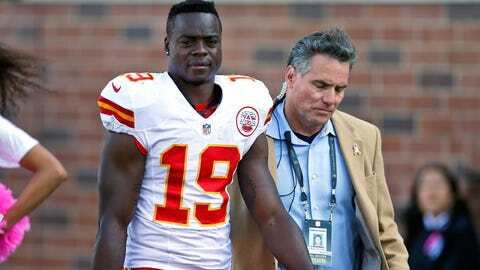 Jeremy Maclin had to leave Sunday's game against the Vikings with a concussion. KANSAS CITY, Mo. — Chiefs wide receiver Jeremy Maclin has passed the league’s concussion protocol and should be available for Sunday’s game against the Pittsburgh Steelers. Maclin was hurt in last week’s loss in Minnesota. He did not work out early in the week while undergoing tests, but returned to practice Friday on a limited basis. "Jeremy practiced, he’s passed everything, we just have to see tomorrow how he feels," coach Andy Reid said. "But he did, he went through practice today and did a nice job with it." Maclin is their leading receiver with 39 catches for 531 yards and a touchdown. Albert Wilson has the next most receptions among wide receivers with eight, and rookie Chris Conley has been the next most productive with 91 yards receiving. The Chiefs’ second-leading receiver is tight end Travis Kelce. Their third-leading receiver is running back Jamaal Charles, now out for the season with a torn ACL in his right knee. "It’s a big task for (Wilson and Conley)," offensive coordinator Doug Pederson said. "You’ve got to rely on, I think, not only those guys but Travis Kelce and your running game. There are other pieces of the puzzle you can lean on, and you’re just hoping Jeremy can play." Defensive tackle Mike DeVito has not passed the league’s concussion protocol after getting hurt in Minnesota and has been ruled out against the Steelers. Inside linebacker Ramik Wilson is doubtful after missing practice all week with knee and ankle injuries. "The swelling stayed out of it pretty good. We just didn’t want it to increase here today," Reid said. "He should be good as we go forward."